Efforts to expand Minnesota's new medical marijuana law next year could hinge who wins the governor's office. Gov. 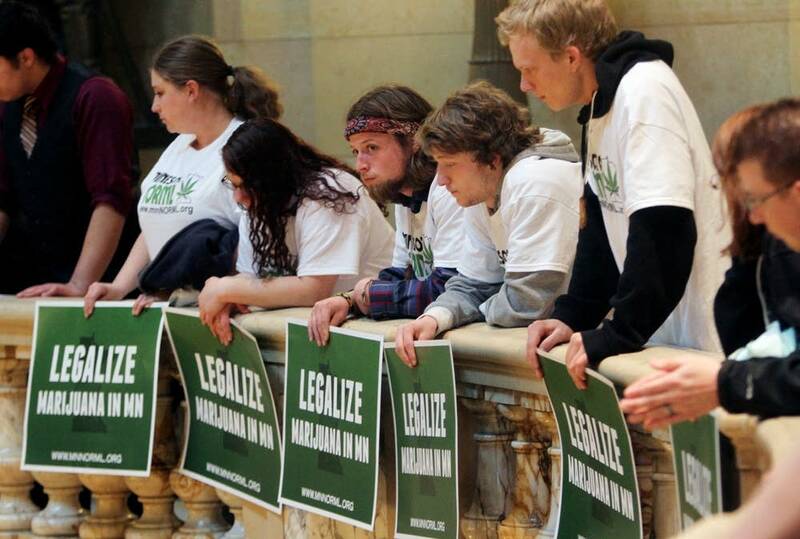 Mark Dayton signed legislation in late May that made Minnesota the 22nd state to legalize medical marijuana. But to win his support, legislators had to craft a compromise with law enforcement groups allowing for cannabis use only in pill and liquid forms. Smoking the plant is prohibited. Dayton isn't saying whether he'll soften his stand on medical marijuana in a second term. This week, the governor said he wants to see the current law implemented first. "I'm very interested to see how that project, once it's started, what difference it makes in the lives of Minnesotans and how it benefits them," he said. "That will be important information at least for me in considering what's next." Marijuana won't be the biggest issue in this year's race for governor, but it will highlight some sharp contrasts among the three major party candidates. Dayton's Republican challenger, Hennepin County Commissioner Jeff Johnson, doesn't view medical marijuana as a big issue, but he said it is one of many that separates him from Dayton. Johnson said he supports a more expansive law that would allow for smoking of marijuana for medicinal purposes. "I do not support recreational legalization, and I never will," Johnson said. "So, I would support something that is a bit broader and allows help for more people, as long as we can ensure that it doesn't become a backdoor recreational legalization bill." Johnson favors the measure passed last spring by the Minnesota Senate, which supporters said would have helped thousands of additional patients. The success of an expected push next session to expand the current law will depend on who is governor, said state Sen. Branden Petersen, R-Andover. A co-sponsor of the Senate bill, Petersen said Johnson is the preferred candidate for advocates of medical cannabis. "For the anywhere from 35 to 50,000 folks who could benefit from a change in the law, I would say it's very important for them," Petersen said. "One thing I found from that community is that they're very intense in their support for that issue." One of those advocates is Heather Azzi, political director of the group Minnesotans for Compassionate Care. Azzi said many of the parents who lobbied for a more expansive bill last session are still bitter about the outcome. She said some won't vote for Dayton because of it. "What I most commonly hear from the parents is that they feel like they had been used and manipulated throughout the process," Azzi said. "They're very upset with what they saw in politics in Minnesota during that last session. They're fairly disgusted by it and a little bit disillusioned." But state Sen. Scott Dibble, the chief Senate sponsor of the medical cannabis bill, said he thinks most people are generally pleased with the legislation that did pass, which he views as a first step. Dibble also thinks the issue will be a political benefit for Dayton, not a liability. "At the end of the day, the governor presided over a very, very difficult policy debate and provided pretty strong leadership in getting something passed," said Dibble, DFL-Minneapolis. "I appreciated that very much. I think the alternative would have been that nothing passed." The other major party candidate for governor, Hannah Nicollet of the Independence Party, has a much bigger goal. Nicollet and the IP support full legalization of marijuana. But Nicollet, the first IP candidate for governor since the party added that plank to its platform, so far has struggled to build campaign momentum. However, she said the cannabis issue is helping her connect with younger voters. "It seems huge as far as the 18 to 30-year-old crowd. It really resonates with them," Nicollet said. "I believe that it is a big issue to them because we've lacked common sense on that front. And I think a lot of people are tired of us putting people in cages who have simply smoked a plant." Two candidates for governor - Libertarian Party candidate Chris Holbrook Chris Wright, who is running under the Grassroots-Legalize Cannabis banner - also support legal marijuana.